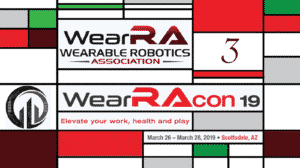 “Elevate Your Life” is the theme for WearRAcon19 – the 4th Annual WearRA Conference – which began under the beat of a dozen drums. Joe Hitt, the executive director of the Wearable Robotics Association kicked things off with a “Robotics Parade” made up of eleven unique exoskeleton devices and a full drum line. The explosive opening was followed by a keynote presentation on NeuroEmbodied Design by none other but Dr. Hugh Herr, director of the biomechatronics group at the MIT Open Media Lab. 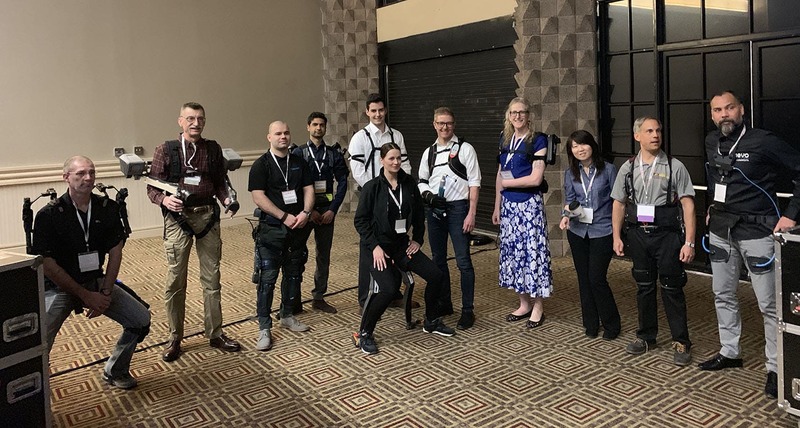 Behind the scenes with 11 unique exoskeletons preparing for the March of the Robots at WearRAcon19. From Dr. Hugh Herr’s point of view, amputations have not changed much since the American Civil War. Muscles are stitched down and can’t move dynamically. Because of that speed and load of a prosthetic or orthotic becomes impossible to be felt. The solution: create and agonist-antagonist amputation surgery to connect muscles together. As one muscle contracts, the other muscle is stretched and sends sensory information out to the brain. The information can then be used to better control prosthetics and orthotics. The new amputation method was shown to provide clearer muscle electrical signal in the amputated leg. This then allows the user’s brain to control the biomechatronic device. The ultimate goal is for the wearable device to be a translator of the user’s intent and not a controller. There is now funding to expand this study. The current prototype uses surface electrodes and one can only speculate how much results could improve with implants. Adoption will also benefit if users can feel their wearables. 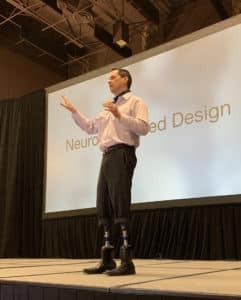 In his excellent keynote speech, Dr. Hugh Herr went into significant detail regarding this topic, new muscle activation detection technology and synthetic computation to control living tissue and functional optical stimulation (not electrical). In Dr. Herr’s opinion, no one will use an exoskeleton if it increases metabolic cost. It just becomes a fancy exercise device (added power – added mass). 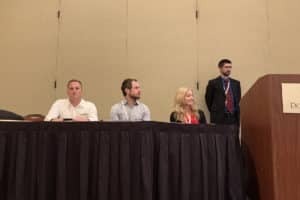 The biomechatronics guru strongly believes that as an industry, exoskeleton developers need to do a better job at quantifying the impact of the wearable on the user. Along with this line of thought, Dr. Hugh Herr is participating in a new company called DEPHY. DEPHY is creating a boot exoskeleton for reducing metabolic cost. It is designed to work with and without a backpack and equally well for level and included surfaces. The powered shoe is built on the concept of the Open Media Lab where everyone is in the same building: artists, designers and engineers. The first keynote presentation of WearRAcon19 was followed by an equally strong presenter: José Pons. A professor at the Nerual Rehabilitation Group, José Pons has literally written the book on Wearable Robotics (see Books on Exoskeletons and Wearable Robotics). 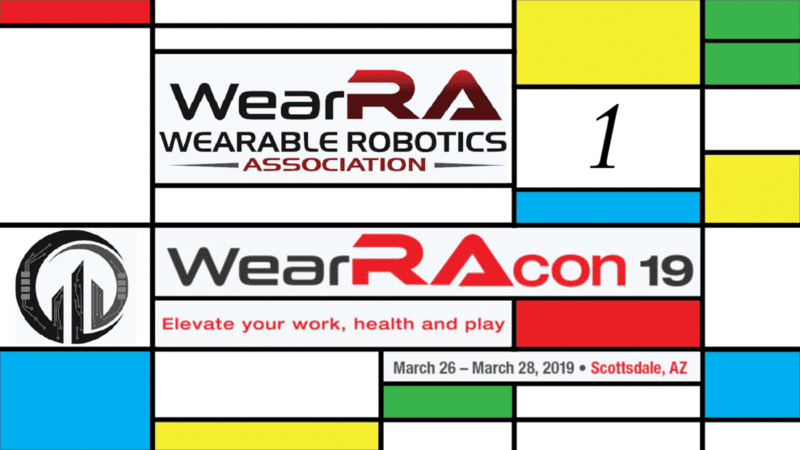 In total, the first day of WearRAcon19 alone included three main stage presentations, one spotlight demo and six breakout panel presentations and discussions with over a dozen presenters! Angel Robotics, a newcomer to the WearRAcon series had a particularly strong spotlight demo. 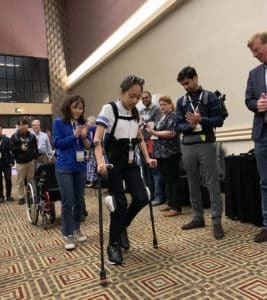 This South Korean company has three powered exoskeleton prototypes in development, all of them focused on walking assistance. The team from Angel Robotics was in 3rd place at the first Cybathlon exoskeleton race. Angel Robotic’s video presentation concluded with their newest pediatric gait assist wearable robot and a big surprise, the user from the last video was in the audience! The 11 year old Chaeyi Park rose up from her wheelchair in her exoskeleton. The Angle Robotics pediatric mobile gait exoskeleton was visually appealing and included custom made jeans that are integrated with the machine. This is the first time we have seen a wearable robot of this size come with customized clothing. Another boundary that the company is pushing is a new twist on virtual reality mobile rehabilitation. Video of an environment, like a famous beach, is taken with a surround camera. The medical exoskeleton user then dons a virtual reality headset and walks through the pre-recorded environment with the help of their exo from anywhere in the world. In addition to all of the other work by the Wearable Robotics Association, WearRA is also in charge of an Automotive Committee. Marisol Barrero from Toyota Motor North America, Marty Smets – Ford, Jason Komorowski – Intel, and Kirk Stema – Levitate used the opportunity to present some of the work by the main committee and subcommittees and outline the current state of exo use in the auto industry, needs, and opportunities. 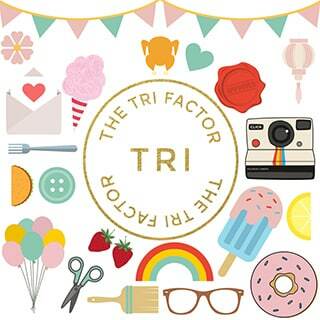 The goal of the group is to share best practices and also some of the rabbit holes to avoid. The group still sees less than 1000 units in use/evaluation, but the number is expected to rapidly increase. There is a lot of work that needs to be done every time an exoskeleton is adopted into a mainstream manufacturing environment. The main path to adoption? Subjective adoption by the workers and objective data to back it up. There is no device that fits all tasks. The wearable has to fit the task. Toyota has developed an internal tool (equation) to determine if a task can benefit from an exo and of course, are there any other safety solutions that could be applied. The long term vision is for team members to be able to pick an exoskeleton just like a worker picks a safety shoe. The auto industry would like to see a larger variety in devices and Toyota is willing to test all of them. Ford is interested in the long term studies 2+ years. Something new from WearRAcon19 is the first discussion on heat dissipation while wearing even small passive exoskeletons. It is possible that as comfort and fit are improving heating is becoming the new adoption challenge. This was a wonderful start to WearRAcon19 and we can’t wait for day two to begin!